Many home extensions these days are conservatories or other buildings with a lot of glazing, but brick built (or stone) is still popular, for a number of good reasons. But how do brick built extensions differ from glazed buildings and why should you pick one? 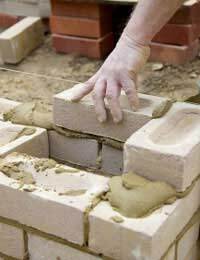 Note that for the purposes of this article the phrase 'brick built' will refer to any outer material such as brick, stone, flint or any other, as opposed to a double-glazed construction such as a conservatory. Of course, one reason for choosing brick may be choice. You may prefer the building to be of brick, stone, or another material, depending on your local area, or you may be forced into that choice by planning restrictions. If you were building in certain rural areas on the Downs in southern England for example, the outer walls of a new extension may well look better if they were of flint and brick, even if planning regulations didn't enforce this. There are two reasons why conservatories became so popular. The first was because double glazing firms found that their units became so cheap to make that they could provide conservatories at a very competitive price, and secondly there is no need to apply for building regulation control as long as they are separated from the main house by solid external quality doors. This made conservatories a lot easier to erect than extensions constructed in the traditional manner. Brick or stone erections can deliver a lot more than a glass box. For a start, the configuration options are huge. Certainly if you are putting up more than one storey, a traditional build is the way to go unless you have serious money available for an avant garde glazed construction. If you need more than one room, even on just the one level, a traditional structure makes dividing much more coherent than walls within a glass box, particular if one of the rooms is going to be a bathroom or a toilet. A traditionally constructed add-on will also be much better insulated than even a double-glazed conservatory too. The construction will have a cavity between the inner wall, usually built of breezeblock, and the outer wall, which will be the more decorative layer. The cavity can be filled with an insulating layer to further enhance the heat retentive properties of the wall. Fitting utilities is a lot easier in a brick built extension as well. If you are going to have a kitchen, for example, it's much easier to fit cabinets against solid wall, and run all the supply pipes for water and gas, and the cabling for electricity, through the walls than try to make ways of concealing them in a glass box. Mounting things such as electrical outlets and shelving is again much simpler. It's not that these things are impossible in a conservatory-style building, just more difficult and challenging, and therefore usually more expensive to boot. Of course, a brick built extension is more of a building project and will take longer than erecting a conservatory. Building regs approval will also need to be obtained, but as far as planning permission is concerned, the rules regarding whether or not it will be needed are the same regardless of construction methods. These will differ in the different countries of the United Kingdom and will vary regionally too, but your local planning office will be able to offer leaflets and advice to help you understand this potential minefield. If you want more than one room, and particularly if you want to use the rooms all the year round without a monstrous heating bill, then brick-built, though likely to be more expensive to construct, will deliver what you need in the long run.